UCLA biochemists have designed specialized proteins that assemble themselves to form tiny molecular cages hundreds of times smaller than a single cell. The creation of these miniature structures may be the first step toward developing new methods of drug delivery or even designing artificial vaccines. "This is the first decisive demonstration of an approach that can be used to combine protein molecules together to create a whole array of nanoscale materials," said Todd Yeates, a UCLA professor of chemistry and biochemistry and a member of the UCLA-DOE Institute of Genomics and Proteomics and the California NanoSystems Institute at UCLA. Published June 1 in the journal Science, the research could be utilized to create cages from any number of different proteins, with potential applications across the fields of medicine and molecular biology. UCLA graduate student Yen-Ting Lai, lead author of the study, used computer models to identify two proteins that could be combined to form perfectly shaped three-dimensional puzzle pieces. Twelve of these specialized pieces fit together to create a molecular cage a mere fraction of the size of a virus. "If you just connect two random proteins together, you expect to get an irregular network," said Yeates, senior author of the study. "In order to control the geometry, the idea was to make a rigid link holding the two proteins in place as if they were parts of a toy puzzle." The specifically designed proteins intermesh to form a hollow lattice that could act as a vessel for drug delivery, he said. "In principle, it would be possible to attach a recognition sequence for cancer cells on the outside of the cage, with a toxin or some other 'magic bullet' contained inside," said Yeates. "That way, the drug could be delivered directly to certain targets like tumor cells." At this stage, the assembled protein cages are porous enough that a drug placed inside would likely leak out during the delivery process, Lai said. His next project will involve constructing a new molecular cage with an interior that will be better sealed. Another use for the versatile protein structures might be as artificial vaccines. Some traditional vaccines use an inactive surface protein from a virus to trick the body's immune system into thinking it is under attack. This method isn't always effective, because sometimes the protein in question doesn't look enough like the virus to trigger a strong response from the body's defenders. However, by decorating the surface of a molecular cage with segments of virus-derived proteins, the tiny structures might better mimic a virus, stimulating an immune response even stronger than a traditional vaccine and better protecting the human recipient from illness. 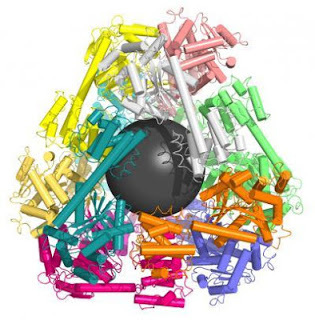 Before these protein structures can be used in medical applications, the molecular containers themselves must be constructed from human-like proteins, rather than the currently employed bacterial proteins that the human body might immediately clear from circulation, Yeates said. "Our first challenge will be repeating these kinds of designs with molecules that are less likely to generate a host immune response," he said. "Generally, we want to use proteins that look like human proteins so the body does not recognize them as foreign." The idea of building complex, self-assembled protein structures has been Yeates' ambition since he published a paper outlining preliminary work on this method in 2001. Yet the concept remained on the back burner for 10 years until Yen-Ting Lai joined Yeates' research group. With three master's degrees -- in structural biology, bioinformatics and biomedical engineering -- Lai had the right combination of skills to bring the research to fruition, Yeates said. This project is federally funded by the National Science Foundation. Other co-authors include UCLA senior staff scientist Duilio Cascio. A second paper co-authored by Yeates creates similarly designed molecular cages using multiple copies of the same protein as building blocks. The scientists control the shape of the cage by computing the sequence of amino acids necessary to link the proteins together at the correct angles. The research, also published May 31 in Science, resulted from a collaboration between the UCLA team and professor David Baker at the University of Washington. This alternative method represents a more versatile approach because it requires only one type of protein to form a structure, Yeates said. However, devising different kinds of links between the identical proteins remains a major challenge. Lead author Neil King, a postdoctoral scholar at the University of Washington and a former student of Yeates, took the numerous computer-generated possibilities and tested each version experimentally until he found one which produced the right behavior. This research is federally funded by the National Institutes of Health and the U.S. Department of Energy. Other UCLA co-authors include senior staff researcher Michael Sawaya.